So yea I bought the new Iphone 5 today along with the other million people. I cruised by the Stoneridge Mall in Pleasanton early this morning to find a HUGE line. No way I was standing in that. I left the mall and figured I’d get it in a few weeks when they were back in stock. My buddy kept urging me to get it, so I fell to his pressure, went back to the Apple store and they had almost no line. Woo hoo. I was pretty impressed with the store. They had security outside directing people and making sure other neighboring store entrances were not blocked. They had a food and drink cart going up and down the line offering free water, juice and snacks. All the employees were in high spirits, smiling and chatting to random people in line trying to keep us from getting too bored as we got closer to the beginning of the line. Once I was a few people from the front of the line a greeter asked my name and used it several times during the conversation. Finally got my turn (only took about 20 minutes). I was in and out in 5 minutes. I made a comment on how white my reps teeth were. She smiled from ear to ear the whole time I was chatting to her. Left the store and the greeter said bye and remembered my name. They get points for that. The store was absolutely packed and he had a lot of names to remember. 🙂 or maybe I was the only extra special one. I really can’t believe how many people love these phones and buy a new with with every revision they have. My old one is about 5 revisions old 🙂 I’m wondering if I’ll stay with Apple for my next phone. They were so cutting edge a few years ago, now I feel like I have an antique compared to some of the other phones on the market. 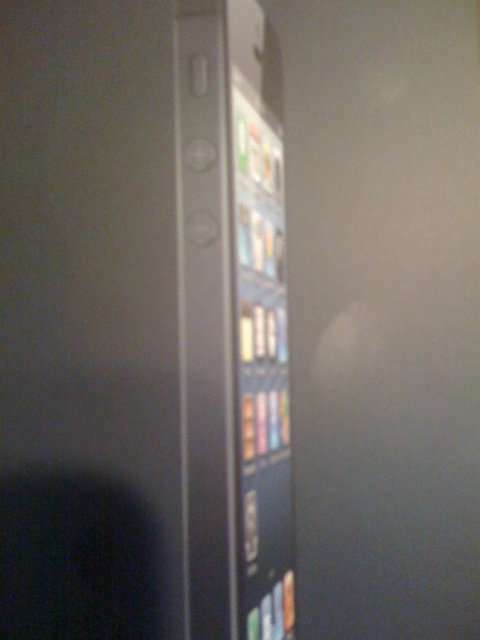 Yep, I bought the new Apple Iphone 5 – Here’s a picture of the box. This entry was posted on Friday, September 21st, 2012 at 6:25 PM	and is filed under Misc.. Both comments and pings are currently closed.